I apologize for the poor quality of some of my Tokyo bridge photos. Many of them were taken on buses going to bigger bridge projects. I actually prefer the smaller bridges. We'll look at just a few more Sumida River bridges, before we move on to bigger Japanese bridges. 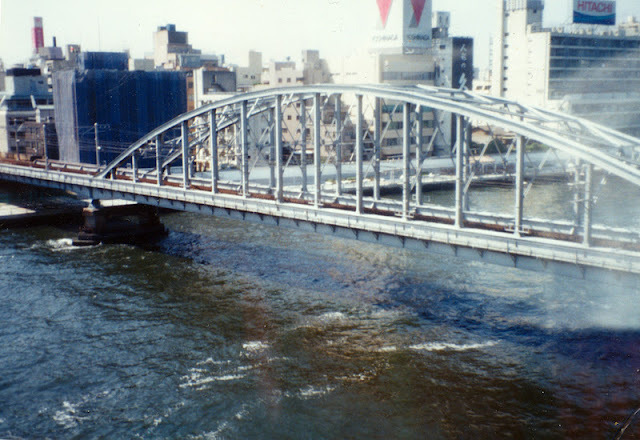 The JR Soubu Line Bridge is tall steel bow-string arch with a long span crossing over the Sumida River. Railroads are as important as roads in Tokyo, especially to the commuters who live one or two hours outside of Tokyo. We are continuing to move downstream towards Tokyo Bay as we move from bridge to bridge. The Soubu Bridge doesn't seem as beefy as the other railway bridges. Perhaps it just carries a single track? Also, the Sumida appears to be getting wider as we continue downstream. We've looked at river crossings in Singapore, in London, in Paris, in Toronto, and in Los Angeles. How are these bridges similar and how are they different. Which cities take the most pride in their bridges and which bridges celebrate their cities? Which cities do the best job of preserving their bridges? Do some cities emphasize a certain kind of river crossing? Tokyo's River Crossings: Sobu Rail Line Bridge across the Sumida River (1) by Mark Yashinsky is licensed under a Creative Commons Attribution-NonCommercial-ShareAlike 3.0 United States License.